Appointments required before visiting the farm. We are extremely busy with daily farm tasks, thus your cooperation with this is greatly appreciated. Thank you. Take Hwy 97 east towards Scandia. You will be on Hwy 97 for about 8-10 miles. Turn Right on Lofton Ave.
At the "T" in the road, turn left onto Mayberry Tr. Our farm is the first driveway on the right after Maxwill Ave. Watch for the rock with our farm name engraved on it. The mail boxes are hidden in the driveway. There are lots of red and white pole barns. Having trouble finding us or running late? Please feel free to call us. at the end of the driveway! 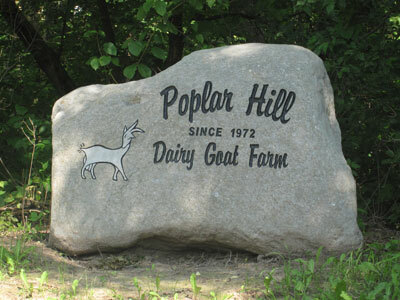 Copyright © 2014, Poplar Hill Dairy Goat Farm. All Rights Reserved.